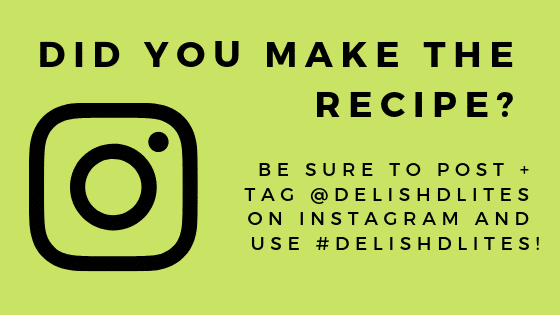 I’m a huge fan of salmon, both for its delicious flavor and health benefits, so I’m always looking for ways to do something creative and keep it from getting monotonous. 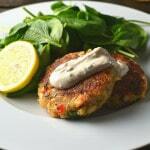 These salmon cakes are a great way to use up leftover cooked salmon or even canned salmon. Flake up the cooked salmon, mix with some bright veggies, fresh herbs and spices, and you’re well on your way to a delicious meal. 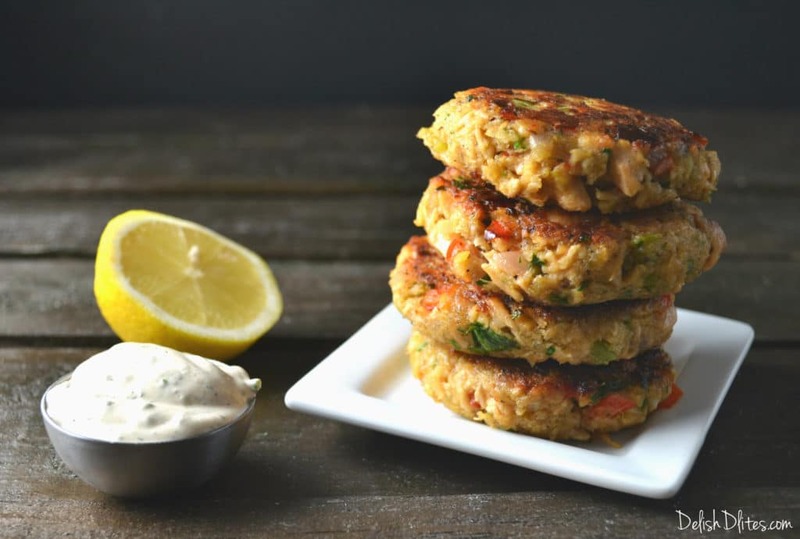 These salmon cakes are bursting with salmon flavor, and aren’t packed with fillers like some other recipes. My tangy, creamy mustard sauce is bursting with fresh flavor, and compliments the salmon perfectly. 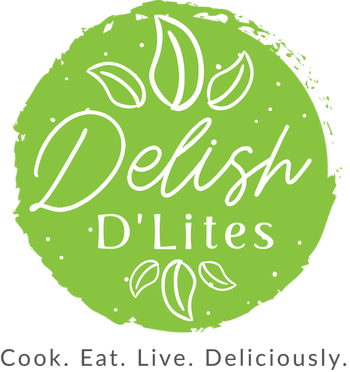 Salmon cakes are perfect for quick weeknight meals, just freeze the uncooked salmon cakes on a parchment lined baking sheet, then pop into a freezer bag. When you’re ready to make them, just saute or bake them for a scrumptious seafood dinner. 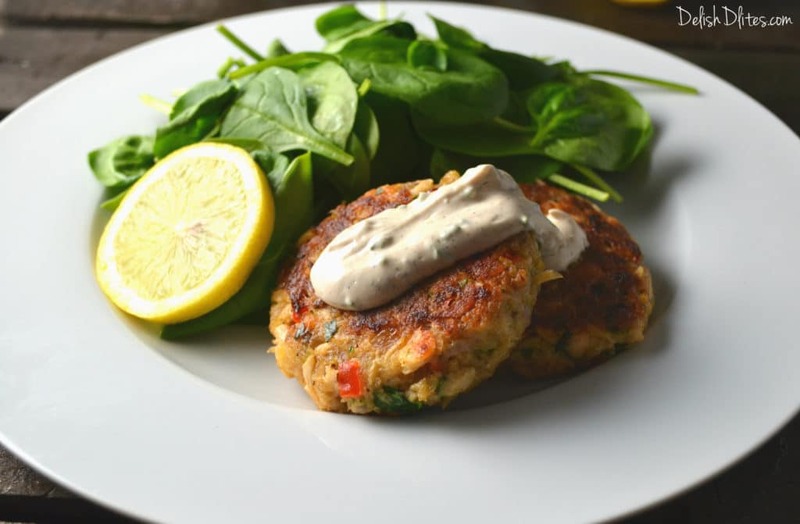 They reheat wonderfully for lunch the next day, and are perfect with a side salad and some yellow rice, or you can even pop these salmon cakes into a sandwich, crabcake style. For the creamy mustard sauce, combine all the ingredients, and stir to combine. Chill for 30 minutes to allow the flavors to blend. Heat a small frying pan on medium heat, then add 2 teaspoons canola oil. Saute the chopped onion, celery and red bell pepper over medium heat, until the veggies are soft but not browned. Remove from the heat and cool to room temperature. Combine the salmon, cooked veggies, parsley, hot sauce, Worcestershire sauce, seafood seasoning, panko breadcrumbs, mayonnaise, mustard, lemon zest and eggs. 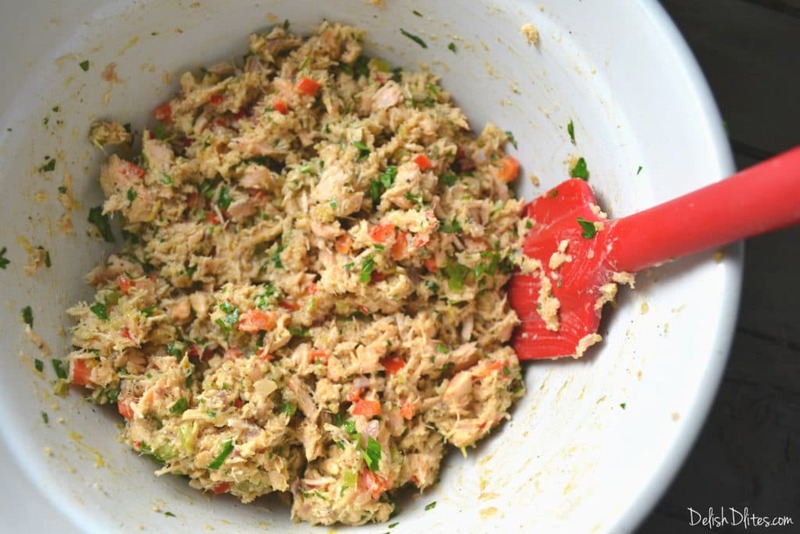 Don’t break up the salmon too much, you want there to be some small chunks of salmon throughout the mixture. 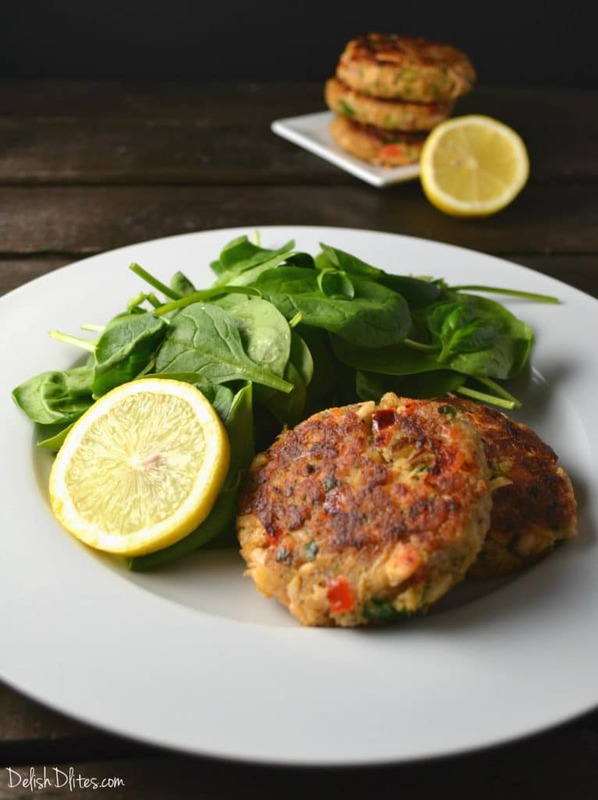 Use a standard ice cream scoop to portion the mixture into 12 equal sized salmon cakes. Use your hands to form these into patties, like you would do when making hamburgers. 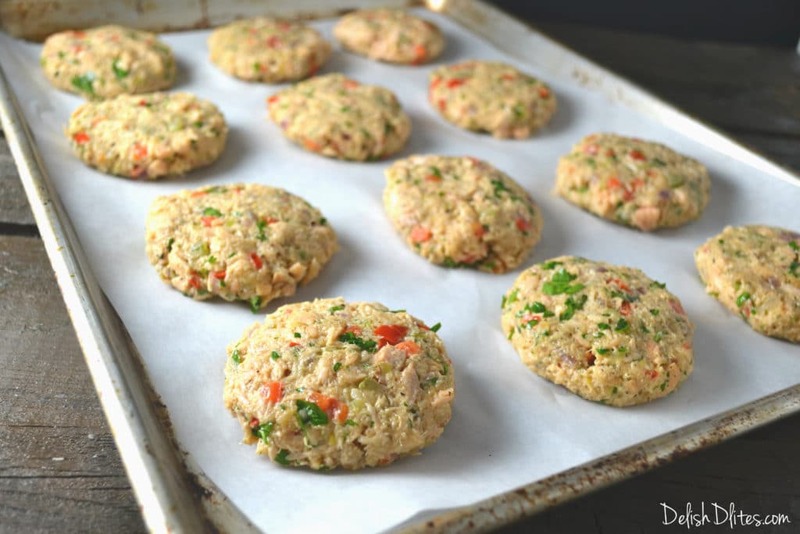 Chill the uncooked salmon cakes in the fridge for 15-20 minutes, so they firm up (or freeze them for later use). Heat 2 tablespoons of canola oil in a frying pan over medium heat. In batches, saute the salmon cakes for 3-4 minutes per side, or until golden brown on both sides. Serve with my creamy mustard dipping sauce. Combine all the ingredients, and stir to combine. Chill for 30 minutes to allow the flavors to blend. Heat a small frying pan on medium heat, then add 2 teaspoons canola oil. Saute the chopped onion, celery and red bell pepper over medium heat, until the veggies are soft but not browned. Remove the cooked veggies from the heat and cool to room temperature. Combine the salmon, cooked veggies, parsley, hot sauce, Worcestershire sauce, seafood seasoning, panko breadcrumbs, mayonnaise, mustard, lemon zest and eggs. Heat 2 tablespoons of canola oil in a frying pan over medium heat. In batches, saute the salmon cakes for 3-4 minutes per side, or until golden brown on both sides. Serve with the creamy mustard dipping sauce. I made and froze the salmon cakes — should I let them thaw completely before cooking them now? You should defrost them before cooking. My husband and I made these tonight and they completely fell apart. When I hadn’t mixed everything together it seemed like the mixture was too wet. The “patties” were more like globs and when we tried pan frying them the fell apart. Any suggestions? You can also try adding some additional breadcrumbs or if you’re using extra large or jumbo eggs that would explain the additional moisture, so perhaps cut back on one egg.